You are here: Home / Mens Health / BPH Information: What is Rezum Therapy? 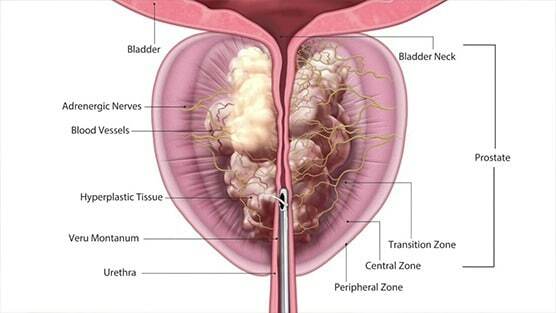 Rezūm is a transurethral RF thermal therapy to treat benign prostatic hyperplasia (BPH) that can be performed in a clinic or outpatient setting. Using a hand-held device, Rezūm delivers radiofrequency generated thermal therapy, in the form of water vapor, directly to the extra prostate tissue that is causing symptoms. Rezūm received FDA approval in 2015 for the treatment of BPH. The Rezūm System uses sterile water vapor (steam) to address BPH by delivering targeted, controlled doses of stored thermal energy directly to the region of the prostate gland with the obstructive tissue that causes BPH. Upon contact with the tissue, the vapor condenses into its liquid state, releasing the stored thermal energy contained within the vapor. This thermal energy is then released directly against the walls of the tissue cells within the treatment zone, gently and immediately denaturing the cell membranes, thereby causing almost instantaneous cell death. Over time, the denatured tissue is absorbed by the body’s immune system response, and the reduction in hyperplastic tissue volume reduces the compression of the urethra, enabling improved urine flow. Since use of the procedure is relatively new, there are no long-term studies to show if it will continue to provide effective symptom relief beyond two years. It’s availability is also limited throughout the Unites States as there are only a limited number of physicians trained in this technique.